Perfectly Created Chaos! 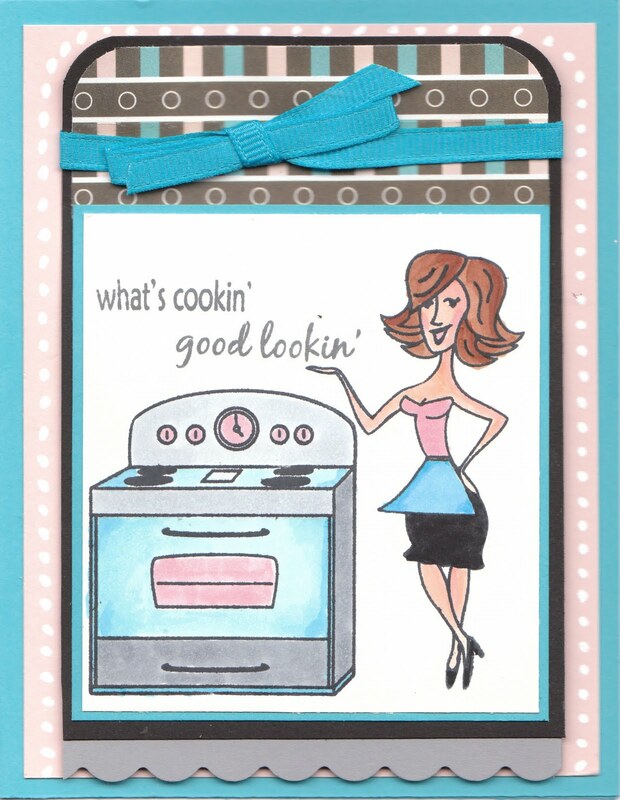 : OCLDT23 "What's Cookin!" Once again, I'm in a hurry but I wanted to post my card for yesterday's OCLDT 23 challenge. I'll try and come back later to put up the details. If not, have a great weekend! I'm back on this beautiful sunny Sunday afternoon to fill in the details about my card from yesterday. I actually did a bit of revamping with it because I picked up some new Copic Markers yesterday while I was out at Hobby Lobby including C5 (Cool Grey 5) and used it around the bottom and side of the stove. As for the rest of the coloring for the stove, I used C1,C2,C5, B00,B02,R20. For Betty I used E00,E01,E02 for her skin. Her hair is E33,E35. Her apron was shaded with B00,Bo2 and B05 and her top is R20. I used just a regular SU black marker for her skirt and shoes. 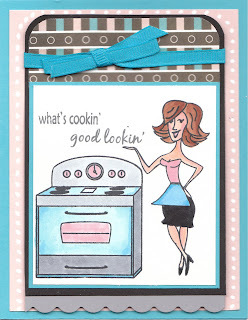 The card has a Tempting TQ base and then I added a layer of Blush Blossom. The patterned paper at the top is from a package I picked up at the $1 store...FOREVER ago. I think everything else is pretty self explanatory. Hope you like it and I hope you enjoy the rest of your weekend! That is SO cute, love the stamped design and your choice of papers!